Originally posted at RH Reality Check. There are some benefits to spending the weekend home alone. For example, you get to be the first person to see all the Facebook pictures of your friends out having fun. Sometimes you also get to watch a pretty amazing thing happen on Twitter. And highjack it they did. Planned Parenthood Director of Digital Strategy Heather Holdridge said that so far at least 53,730 tweets have been posted in support of the organization. Of the top 25 tweets using the hashtag (measured in terms of impressions), 23 are in support Planned Parenthood. In terms of evaluating the effect an effort like this actually has, we have to assume that once Wildfire called off the tweetup, very few antis were following the hashtag. I witnessed some back-and-forth about Margaret Sanger—”She promoted eugenics!” “No she didn’t!”—and about the difference between “life” and the ability to survive outside the womb. But I saw no evidence that the parties engaged in these discussions were swaying one another. The outpouring of pro-choice support may give some antis pause, but undoubtedly many will double down, invigorated by their martyrdom. 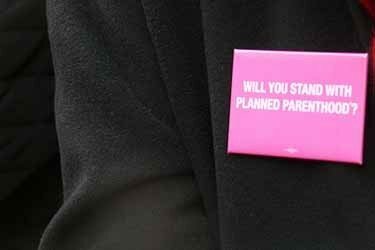 If anything, the success of the event should be measured in terms of Planned Parenthood’s public image, and the extent to which the relentless campaign against the group can be turned on its head. Bruns thinks it can be. “It becomes a lot harder for anti-choicers to stigmatize Planned Parenthood, or downplay its incredibly vital role in providing health care to millions of people, when there are literally tens of thousands of tweets out there saying otherwise,” she said. Me, I’m up for anything that allows me to support my causes with irony.